Dr. Steve Carmichael is a versatile saxophonist residing in Mclean, Virginia. Feeling at home in multiple music scenarios, Steve performs at ease in the classical, jazz, and commercial musical idioms. Serving for 20 years as a saxophone and flute instrumentalist with the US Navy Music Program, he has performed for audiences in over 40 countries, including France, Italy, China, Russia, Australia, Germany, England, Jakarta, Hong Kong, Scotland, and many others. 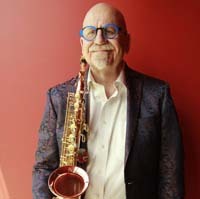 Steve has performed at the Monterrey Jazz Festival, Montreux Jazz Festival, Yokohama Jazz Festival, US Navy Band International Saxophone Symposium, and North American Saxophone Alliance regional and national conferences. He has performed with the San Diego Symphony, Chattanooga Symphony, NHK Tokyo Symphony, Chicago’s Northshore Concert Band, Nelson Riddle Orchestra, Nuova Vista (Italy), the Susan Cook Saxophone Quartet, Spectrum Saxophone Quartet, and the San Diego Wind Ensemble. The Colshire Winds was formed in 2017 to perform new and transcribed music for Saxophone and Flute. Combining traditional elements with contemporary constructs the Colshire Winds has found great success performing in recitals and at conferences throughout the United States. Dr. Karen Judkins - is a freelance musician and teacher in the Washington, DC area. She attended Oberlin Conservatory for undergraduate studies and received both MM and DMA degrees from the State University of New York at Stony Brook. Dr. Judkins has performed in the New York Bach Aria Festival and recently presented the Washington area premiere of Yuko Uebayashi's au dela du Temps for two flutes and piano.